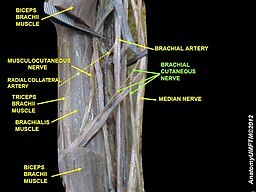 The Musculocutaneous nerve is a large branch of the Brachial Plexus that supplies the flexors of the arm and sensation to the lateral forearm. The Musculocutaneous nerve is a terminal branch of the lateral cord of the Brachial Plexus. It emerges at the inferior border of Pectoralis minor muscle. It has root values of C5, C6 and C7. It leaves the axilla to then pierce the Corocobrachialis near it humeral insertion. It then travels laterally down the arm, superficial to the Brachialis but deep to the Biceps Brachii muscle. It terminates 2cm above the elbow as the Lateral Cutaneous nerve of the forearm. Coracobrachialis - flexs and adducts the glenohumeral (GH) joint and acts to stabilise the humeral head in the glenoid fossa when the arm is hanging freely by side. Brachialis- flexion of the elbow joint. Biceps Brachii- a weak abductor of GH joint when arm externally rotated. Weak flexor of GH joint. Helps to stabilise GH joint when weight carried in arm. A supinator and flexor of the elbow joint. Compression injury eg weight lifting or sports involving lots of forarm flexing and supination.The biceps aponeurosis and tendon compress against the fascia of the brachialis muscle causing sensory loss below the elbow on the lateral side of the forearm. Considerable anatomical variations present with this nerve. This may lead to clinical implications in eg surgery, diagnosis. Check strength of Biceps Brachii, Corocobrachialis and Brachialis muscles . Check for Differential Diagnoses- namely C5/6 Radiculopathy; biceps Brachii distal insertion tear.